Augmented Reality is the combination of real and digital worlds reflected on your smart device screen. WATCHAR app is one of the coolest way of interacting between those two parallel worlds and bringing it to life. WATCHAR is an amazing new way to instantly unlock the world around you with exclusive content, entertainment and virtual experiences. Just through your device discover and share cool new content from business cards, magazines, posters, flyers, buildings, people and more! It’s like opening a window to another dimension, where ordinary things can transform into a 3D things, interactive stuff, 3D video files or even 3D characters to play games with in the real world. It enhance the senses of what we see, hear or feel and fills out with an additional content. All you have to do is download and launch the app, locate your phone at WATCHAR marked things or places and start enjoying 3D interactive things brought to life in front of you! 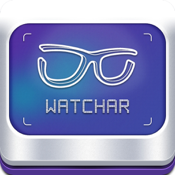 * Using WATCHAR app point your device at one of the things - AR triggers (logo, QR code, business card, building, POI, CV, postcard, flyer and other). * Locate and hold it fixed to see the interactive content appeared. d) Item you scanned has not been enhanced with WATCHAR content. As soon as you sign up, we will contact you for further partnership information. Join us on Facebook and Twitter to give us your feedback and tell us what you'd like to see more!